Yippee! We're above zero and the sun is shining. Oh happy day. 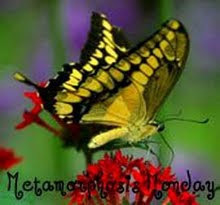 Welcome to Metamorphosis Monday. Each week this event is hosted by Susan, where we see all sorts of Metamorphosis going on all over blog land. With the cold that has taken over our area, our kitchen was a bit cooler than we like it. Saturday evening a light went off and I decided to shake things up around here. 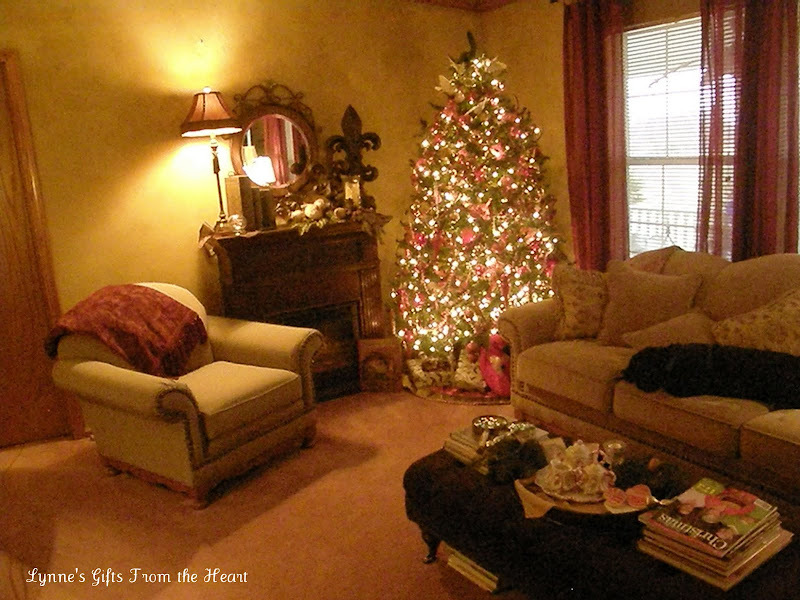 This is the way you saw our living room at Christmas. Now, folks.. don't think you're getting off that easy.. you were really hoping to see this room with just the Christmas tree gone, right? Well..... let me show you what I've been up to the last couple of days or so. Yes, ... the tree came down. BUT then.. I went about stripping the furniture of all of it's goodies. Had to head downstairs and bring the movers up to start shaking things up. This is how things ended up, for about a day. lol You see after looking at it I realized the mirror was too small for the expanse of the wall. It was actually too small before. 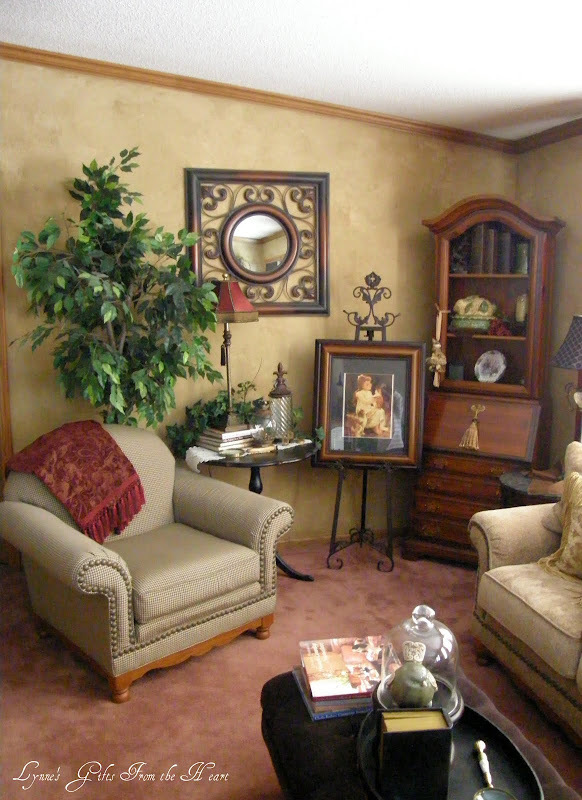 lol So, back down the stairs again to locate this mirror, I then added the tree to balance things out a bit more. I would really love to find 2 pictures to hang behind the chair, but until those are located, the tree will do just fine. :-)) The secretary in the corner is actually a stereo Mr. P. gave me for Valentine's Day 32 years ago. It is another one of those floater pieces. I moved it from the kitchen. 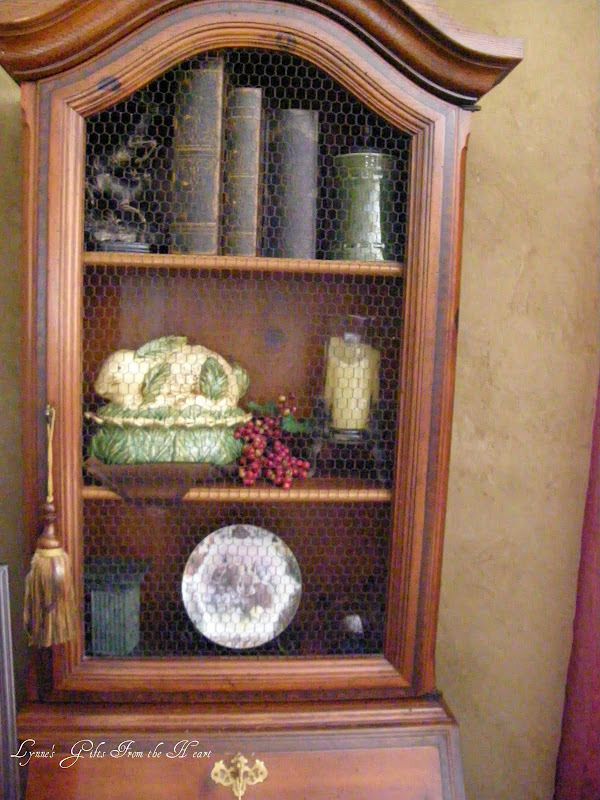 Behind the chicken wire I've added a few of my favorite things. A couple of those being rabbits and a tassel for the handle. With the rabbit theme going on, I switched out the tassels. Do you see this beauty hanging? This is the wall the stereo sat on. Now you can see the fireplace has made it's way into the kitchen. You see, I don't have a "real" fireplace. I purchased this one a few years back at Walmart. Brought it home and Mr. P, Bailey and I put it together. Gosh, Bailey was still toddling around here, so I have it longer than I thought. My little man will be 10 in June. lol Any hoo.... I love the way it looks in the kitchen. 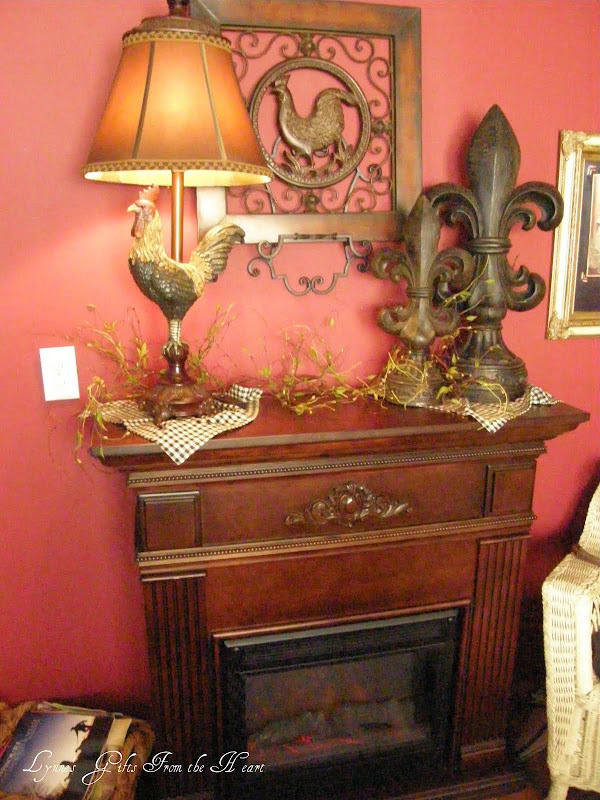 The tone of the wood is perfect resting on the wood floors, and even has a decorative scroll work on the front. Maybe, not a real flame, but at least I have the effect. lol The difference between a chilly kitchen and a warm one is incredible. Once I got Mr. P up to show him what I'd been doing, I was amazed at the smile it put on his face. He said, "that's something that should have been done along time ago!" Yes, you read it, I have evidence, the man was "pleased" I moved furniture around. lol Now coming from him right now, that small amount of praise means the world. :-)) The kitchen was taken over a while back with roosters. I adore them in this room. I also have quite the "weakness" for lamps. When we got this lamp in over at work I immediately put my name on one. I've had it for a couple of years or so now. It's sat behind the love seat on sugar buckets till now. I think it's perfect on top the fireplace. Close up of plaque . We carry this wonderful curly twig over at work. It is the most whimsical stuff I've seen in forever. 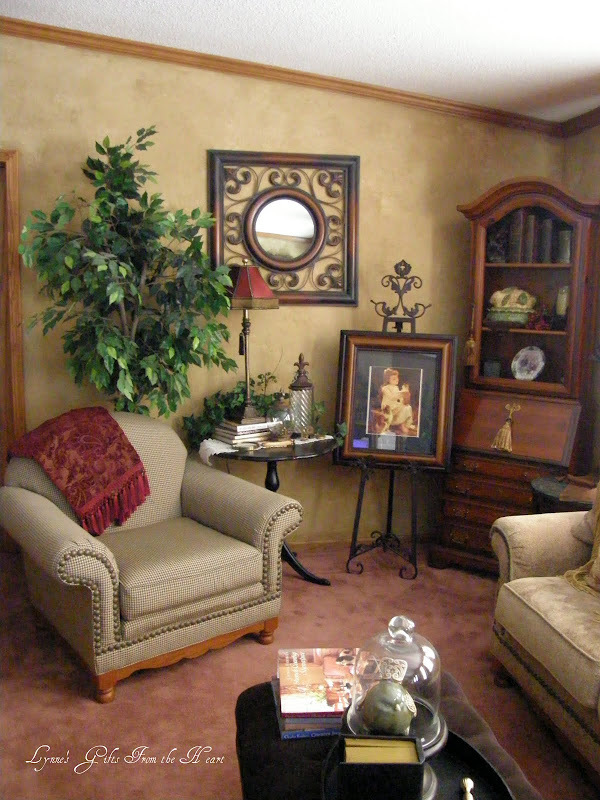 I love to use it above pictures, mirrors and as you can see here, draped around lamps or other decorative items. You'll see this in a future post used in a different way. I hope you stay tuned to see that. :-)) What do we have here? A blooper???? Nah... just a tease of another upcoming Metamorphosis that has taken place around here. Can any of you guess what room this might be in? I hope you have enjoyed my metamorphosis this week. There are many more changes going on through out blog land. 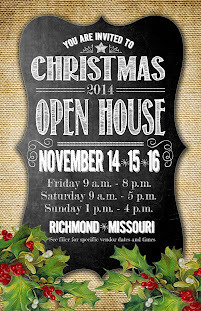 Be sure to swing over to Susan's for a full list of those participating.. Thank you for stopping in to say hello. You, however have recaptured it beautifully! Woo/hoo Lynne, all I can say is that the room was beautiful before, but even more beautiful now!!! You really have a talent and an eye for putting everything together. Love the changes....that fireplace is so nice...I would love one someday. Where do you work that you see all these cute things?? Oh Lynne! This looks FABULOUS!! I love it!! I LOVE bunnies too AND roosters so I am loving yours! The fireplace in the kitchen was genius!! You did awesome!! Love what you have put together. Shopping the house is so much fun and not only do people who visit think they are seeing 'new' things that are pulled from other less traveled areas of the home, but it looks new to us too....love it all. You have a great knack for decorating. 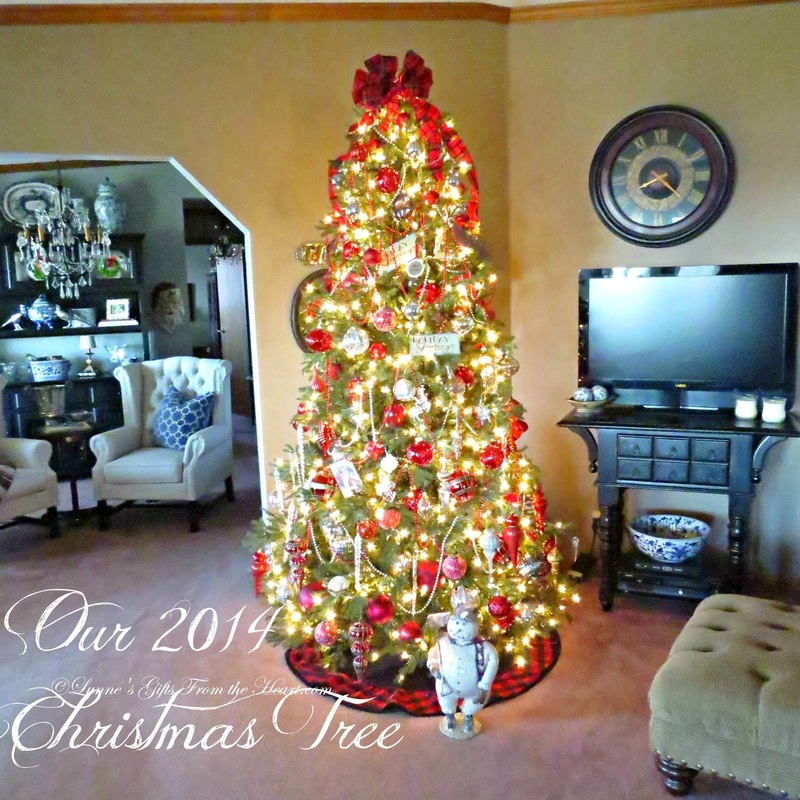 I loved your Christmas setting but this is just darling too! 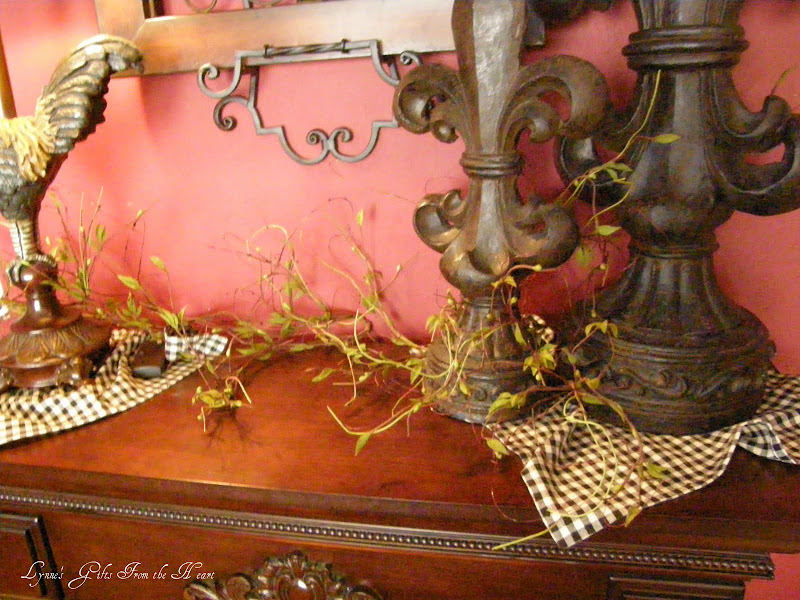 I am putting out a few things now after putting away all they things from the house tour. Sometimes we all just need a breather to get the energy "get with the program". Thanks for sharing all your beauty. You did a great job changing things around-it is lovely! This is just lovely, Lynne! I took in such a breath when I saw your giant fleur de lys' that I almost choked. Those are fantastic ~ love them! What a darling tassel! Everything looks so warm and pretty. I love your before/after. You do have the touch! I liked it before and I like it now too! I can't believe Walmart sold those fireplaces. I love them. 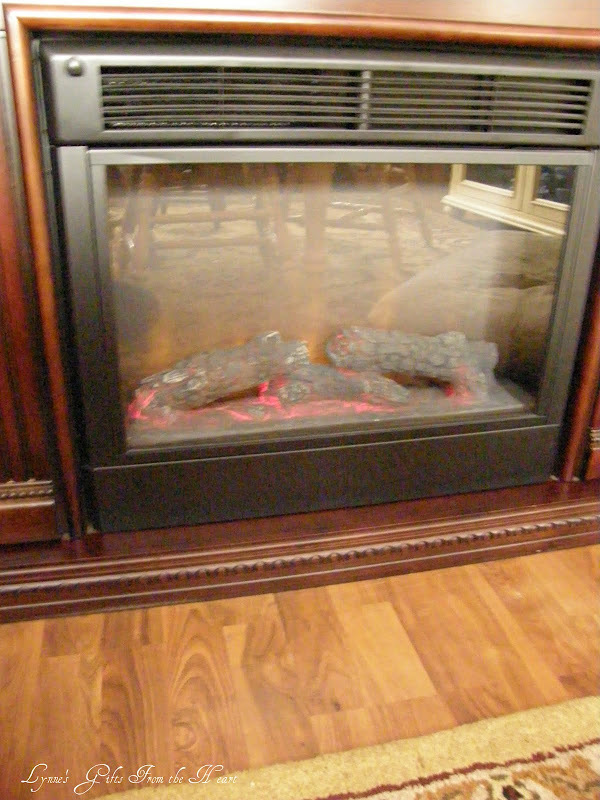 Larry and I actually priced one in Nov bz our basement gets so cold and I love the way they look. We'll have to wait for another year to get one but I do love them. Your photography is so clear and wonderful too. Love it Lynne - it looks fantastic! And, I'm glad Mr. P was able to appreciate your efforts! Have you seen the bunny lamps at Kirkland's? I saw it Saturday when we were in there and I instantly thought of you! It was too cute - the lady working there forgot to put some of my things in the bag and I have to go back for them - I think I may have to pick up a bunny lamp! ;-) You've got me thinkin' bunnies! Have a good one! Oh, your room does look great, not sure if I mentioned that or not in my "bunny lamp" excitement! Well here I'm been whining that I can't get a thing done and you have redone your whole house....Lynne is looks just beautiful my friend...I love the picture with the easel and I need some of those green thingys email me about them PLEASE...I know thats my guest room your working on right ha ha!! 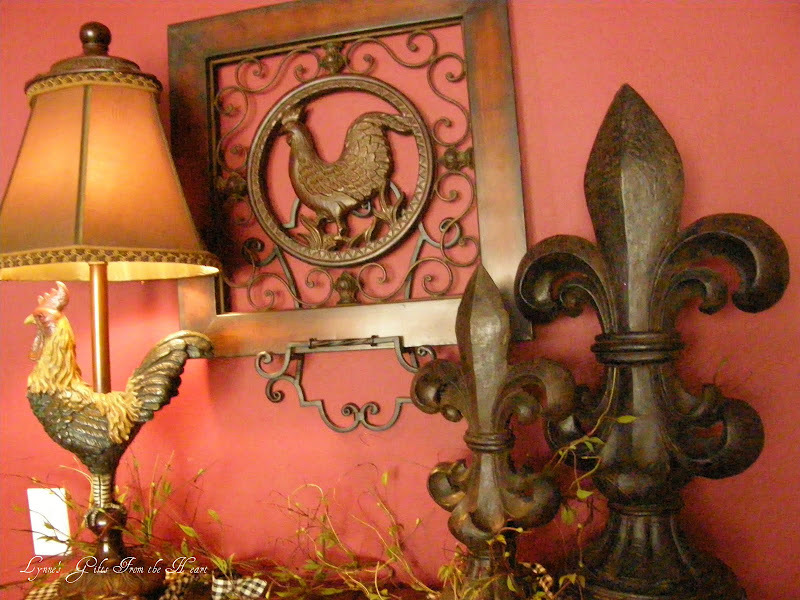 Your home is so beautiful Lynne! What a wonderful job you did rearanging the two rooms. It looks like a very warm and cozy space with the fireplace in the kitchen. 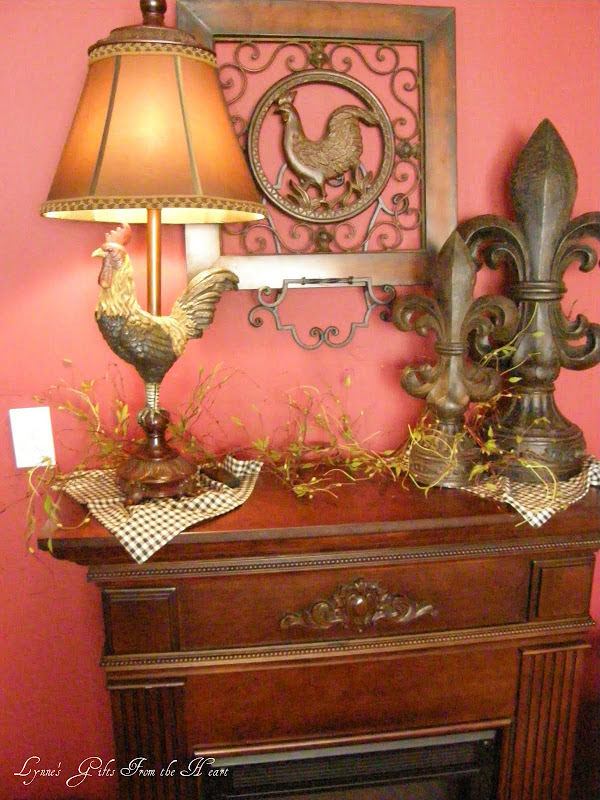 Love the lamp and precious bunny tassel! Is that your toile guest room? Stunning makeover! 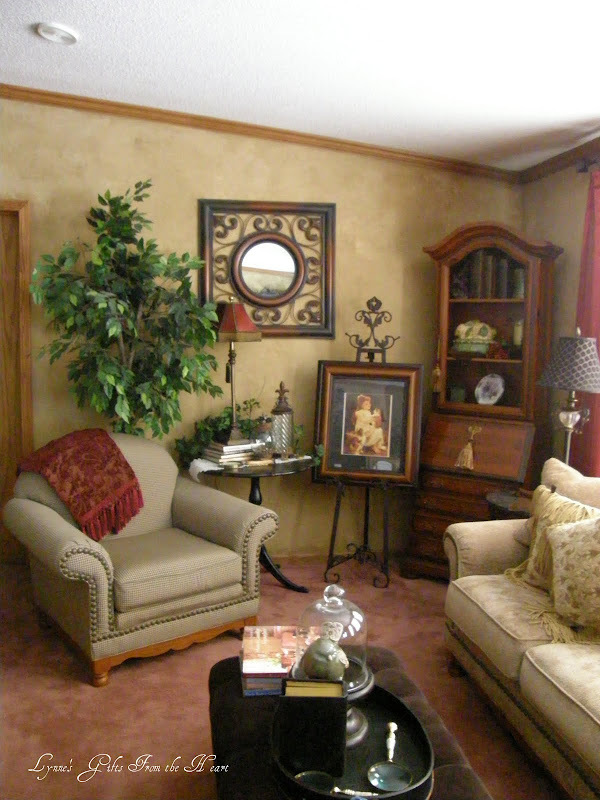 I love how the room started out but you have transformed it into the perfect space! 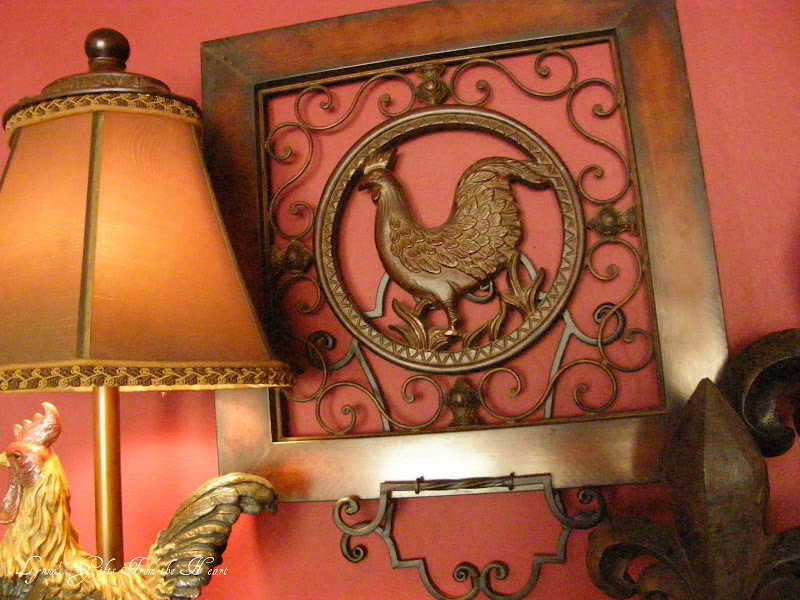 Everything is well thought out and placed - I would love to have that look in my own home! 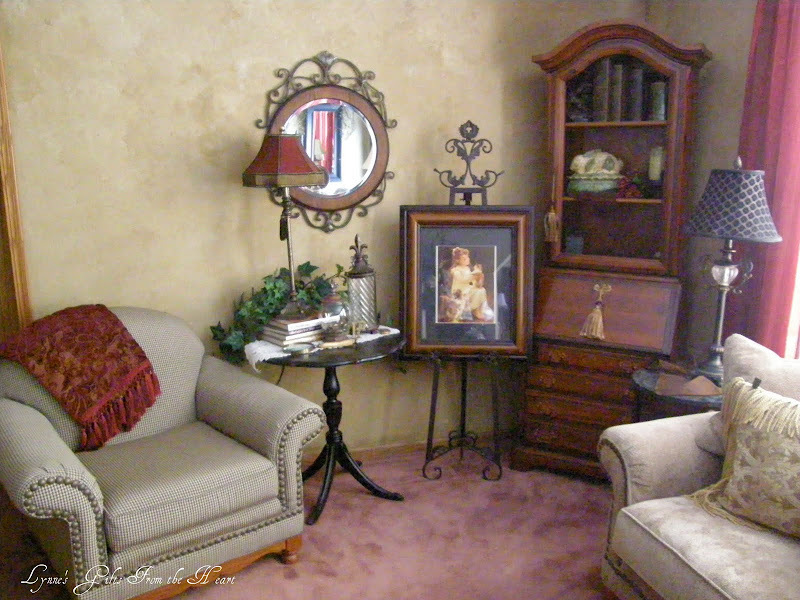 I'm off to check out some of your older posts of other rooms in your home - it is beautiful! I ♥ your twiggy-branches...what a nice touch! Wish I could have you do my shopping & arranging for me! Congrats on getting into the + temps! Your re-designs look great. I especially like the stereo piece that looks like a secretary. 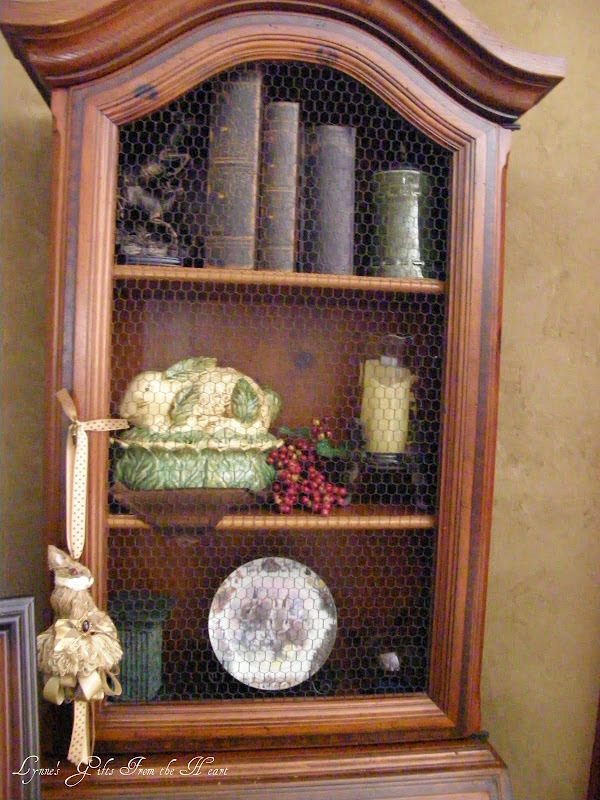 I collect bunnies too and love the rabbit behind the chicken wire, and the tassel Gloria made for you! Do you sell the soup tureen (or whatever it is?) Have a great week and stay warm! Okay I love it all! 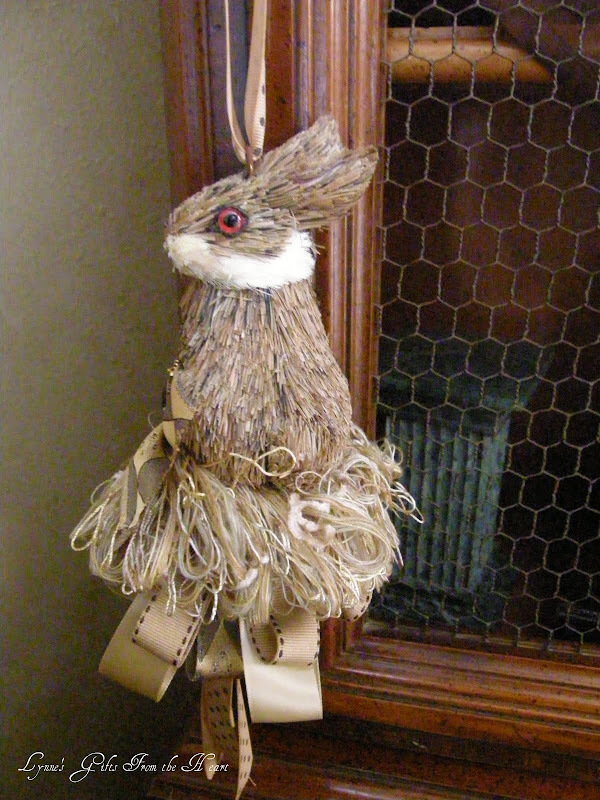 That rabbit tassle was a GREAT gift!! 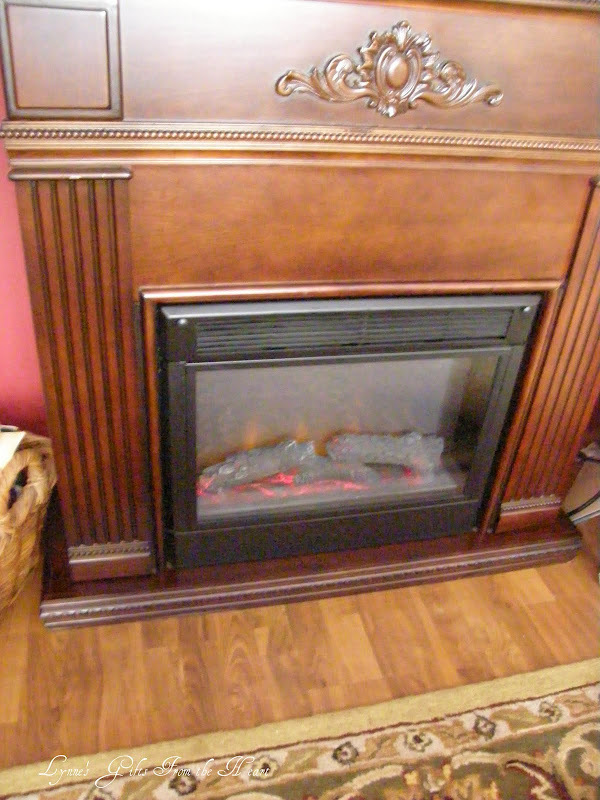 And a movable fireplace -- now that is GREAT!! It's a beautiful makeover, Lynne! I love shopping the house! This is just darling! 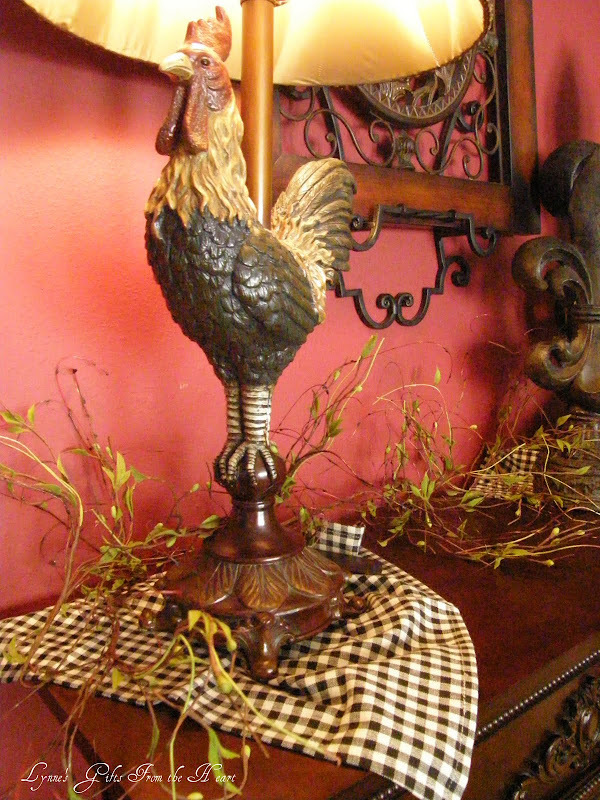 I love the switch you made and agree the fireplace is adorable in the kitchen and your rooster lamp stands tall & proud! Love it all. Now can you come do my living room? P.S. 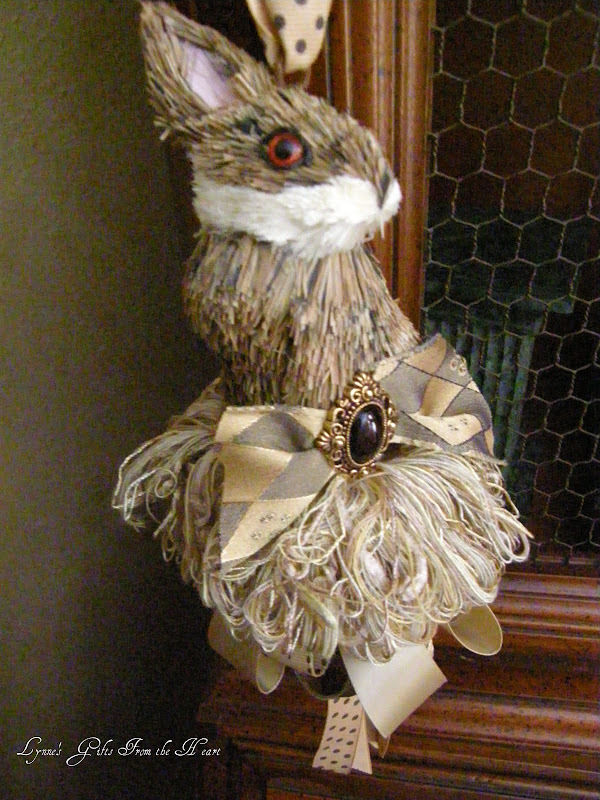 the bunny tassel is a priceless treasure from a super dear friend. There is truly nothing sweeter. Me again! 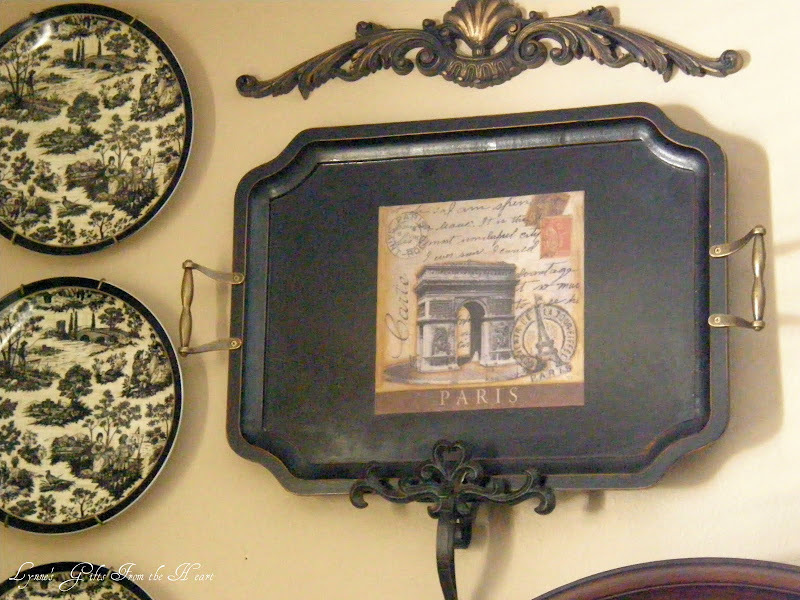 You asked if I remembered anything about the flatware - I really don't as I really did not pay a lot of attention to it, as I was not in the market for something like that. It was pretty. Not sure - but think it was $150 for the set. Have a great week. Hope Mr.P is doing better.